It was only an act of legal chicanery that changed the rather innocuous name of The Butler to its more ungainly official title Lee Daniels' The Butler (though it's still relatively svelte compared to his earlier film, Precious: Based on the Novel "Push" by Sapphire, a title which is still being used as a punchline four years later) but it resulted in one great irony: despite putting his name in the title, The Butler barely feels like a Lee Daniels film at all. That's not to say that it completely lacks his stamp. Many of his past collaborators show up in roles both big (Lenny Kravitz, Cuba Gooding, Jr., John Cusack) and small (Mariah Carey), and it maintains the odd mixture ribald humour and melodrama that has characterised his previous work - a balance best illustrated by a scene in which Cecil Gaines (Forest Whitaker) and his wife Gloria (Oprah Winfrey) receive tragic news whilst kitted out in ridiculous disco attire. Yet it largely lacks the irreverent, bizarre fizz that has made him such a divisive and fascinating filmmaker. Much like its central character, The Butler spends much of its time putting on a calm, respectful demeanour, only occasionally letting its hair down when the focus moves outside the White House. In telling the story of Gaines, a man who spends his life working as a butler to every president from Eisenhower to Reagan, Daniels seems to have been cowed by the capital-I Importance of the story, which not only touches upon the real-life story of Eugene Allen, but uses it as a filter to explore the history of the Civil Rights movement. 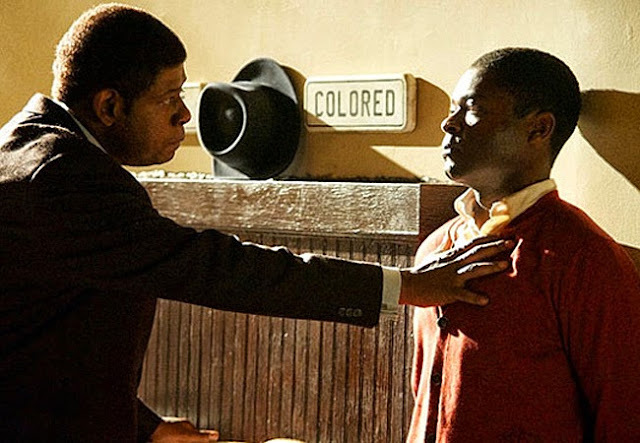 Through Gaines' position near the heart of American politics, we are given a glimpse of the ways in which different administrations regarded the battle for equality, but the changing face of the struggle is also represented by Cecil's son Loius (David Oyelowo), who passes through seemingly every possible iteration of the movement during his lifetime. Unsurprisingly, there is a pretty sharp divide between the two halves of the film. Every sequence set within the walls of 1600 Pennsylvania Avenue feels like an opportunity for a different famous actor to play dress up. There's nothing wrong with that approach, especially since Daniels keeps things moving along and never lingers with any single administration for too long (even going so far as to ignore the Ford and Carter years completely), but it's an hilariously broad one that leaves the audience at the mercy of whichever actor is hamming it up on screen at any given moment. Some do better than others: against all expectations, Robin Williams is admirably restrained as Eisenhower, while John Cusack is surprisingly convincing as Nixon despite looking and sounding nothing like him; but James Marsden is in full on "pahk the cah in Hah-vard yahd" mode as JFK, Alan Rickman is just distracting as Reagan, and Liev Schreiber is truly bizarre as LBJ, who spends an usual amount of his screen time sitting on a toilet. This picaresque approach has a campy quality to it which is weirdly charming, and it does offer some insight into historical events such as, for example, Nixon's idea to co-opt the term "Black Power" and redefine it to refer to black business oweners, but it also feels like a way for the film to cram as many award contender moments into as little space as possible. The more interesting story, in terms both dramatic and thematic, is the one of Gaines' family, and particularly his relationship to Louis. As a man who grew up on a cotton farm, witnessed his father being murdered for talking to a white man and then escaped from the South, with all its lynching and associated hatred, as quickly as he could, Cecil believes that the best chance for survival is to work calmly, quietly and to not make too many waves. Louis' increasingly more radical approach, which sees him participate in sit-ins, become a Freedom Rider, spend time with Martin Luther King and join the Black Panthers, puts him at odds with his father, and the generational and ideological tension between the two is the most interesting and powerful aspect of the story. Again, there is a broadness to this half of the film (the Black Panther scenes, in particular, are so stereotypical that they might as well be outtakes from Black Dynamite), one that is encouraged by both the length of time covered and screenwriter Danny Strong's insistence on having Louis meet every single important figure in Civil Rights history, but it also explores an area of history which is often left untouched, and it does so in a way that is grounded in a more personal dynamic. It's often pretty ham-fisted in its attempts to drum up drama, such as the inclusion of a second Gaines son whose only purpose seems to be to make jokes then go to Vietnam to, well, you can probably guess, and act as a further wedge between father and son, but it still offers up genuinely provocative points. It's worth the moments of forced conflict to see the film examine the notion that men like Cecil Gaines, who worked so hard not to be noticed, were actually subverting racial stereotypes and played an important role in black history. Lee Daniels' The Butler is a misshapen lump of a film, one that veers uncomfortably from moments of abject misery to ones of broader than broad comedy, of both the intentional and unintentional kind, but it's nevertheless an interesting one. It offers a glimpse of a tumultuous period of American history, and earnestly investigates the roiling tensions within the African-American community through the prism of a single family. It lacks any real nuance, its characters are little more than cyphers through which the audience experiences the events around them and it is at times cloyingly sentimental, but it's also charmingly unpretentious in its approach to being an Important film about Important things. And it is, ultimately, an important film, though less through its own merits than its unfortunate rarity as a mainstream American movie about the black experience in the 20th century. Maybe the real lesson of The Butler as a film is that, at a certain point, you just have to be happy with what you can get, which is unfortunate, since that's the exact opposite message that the story is trying to convey.